The latest addition to the line up of great eateries at Fourth Street Live is Pizza Bar! This casual restaurant brings the flavor and convenience of one of America’s greatest foods to downtown Louisville. For those who frequent the Big Apple, pizza by the slice is always an assumed commodity and readily available. The availability of these individual slices late at night is not always common elsewhere, so I expect this will be a very popular feature here in the Derby City! This casual new downtown Louisville restaurant offers indoor and outdoor seating on 4th Street and a fun casual dining room to make you feel immediately at ease. The outdoor patio offers plenty of room to enjoy yourself with unbeatable people watching. 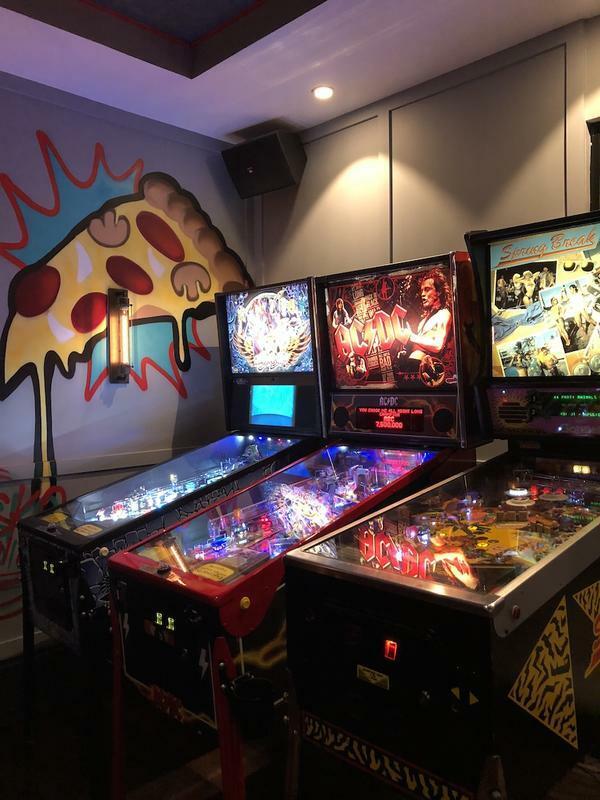 The indoor dining area is rustic and cozy, featuring several big screen TVs, beer pong tables, skee ball, video games with big screens and an arcade with some nostalgic pinball machines. You’ll definitely find yourself spending some quality time here! Pizza Bar Louisville Has an Extensive Selection of Craft Beers! One of the most popular items on the menu here, besides the great pizza, is their incredible selection of canned and draft beers. 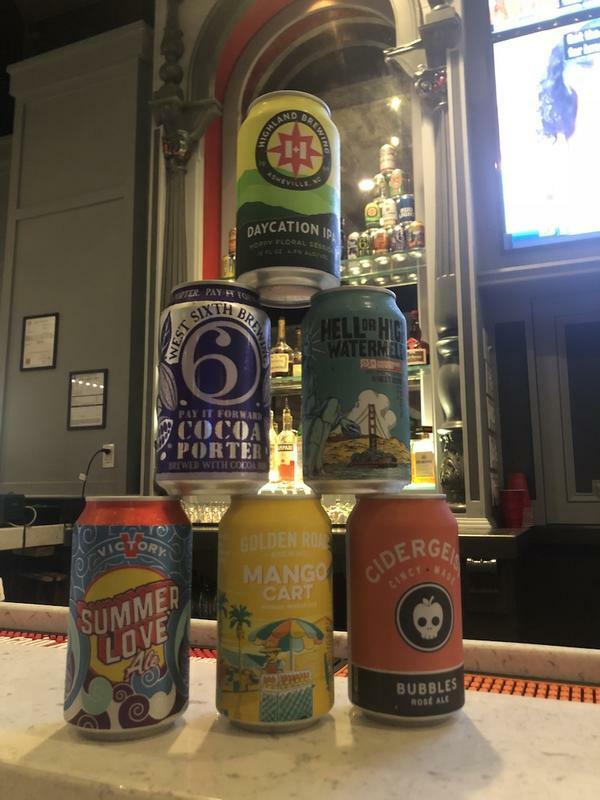 Canned beers from local favorites such as Highland Brewing, West Sixth Brewery, Victory, Golden Road, 21st Amendment and Rhinegeist are always on hand and ice cold. Their drafts on tap also include local favorites, alongside long time staples like Stella Artois. Pizza Bar Louisville Menu Has MuchTo Offer! After taking in all the potential activities available in the dining room, we settled in for an appetizer and some pizza to end the day. 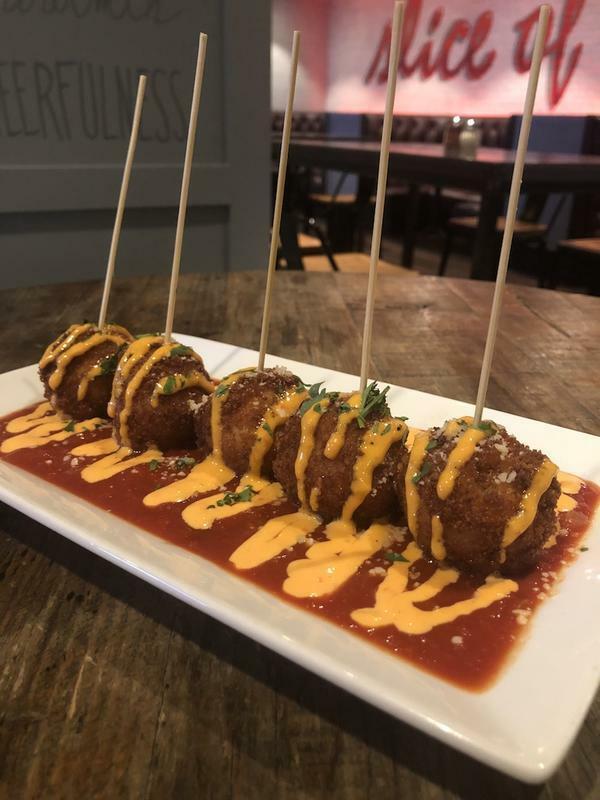 We started with an order of the Arancini, a house favorite, and it only took one bite to understand why! These delicious, deep-fried delicacies are made with roasted cauliflower risotto, stuffed with mascarpone, fried golden brown and served with a red pepper aioli. A creative to start the meal for sure! I’d say no meal here is complete without an order of these delicious appetizers. It was tough to choose from the large variety of pies offered at Pizza Bar in Louisville, because every single one of them sounded delicious! For the main event, we selected the Veg Your Bet vegetable pizza. 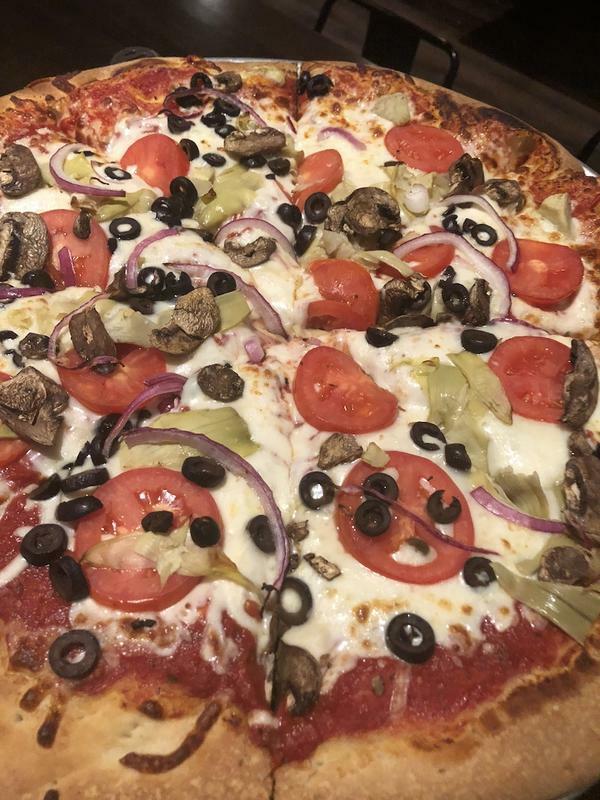 It arrived with generous portions of mushrooms, roma tomatoes, carmelized onions, black olives, roasted red peppers and was piled high with mozzarella cheese. The crust was crisp (as we had hoped) and the pie definitely did not last long! For those who are not quite so hungry, cheese and pepperoni pizza is served by the slice all day. 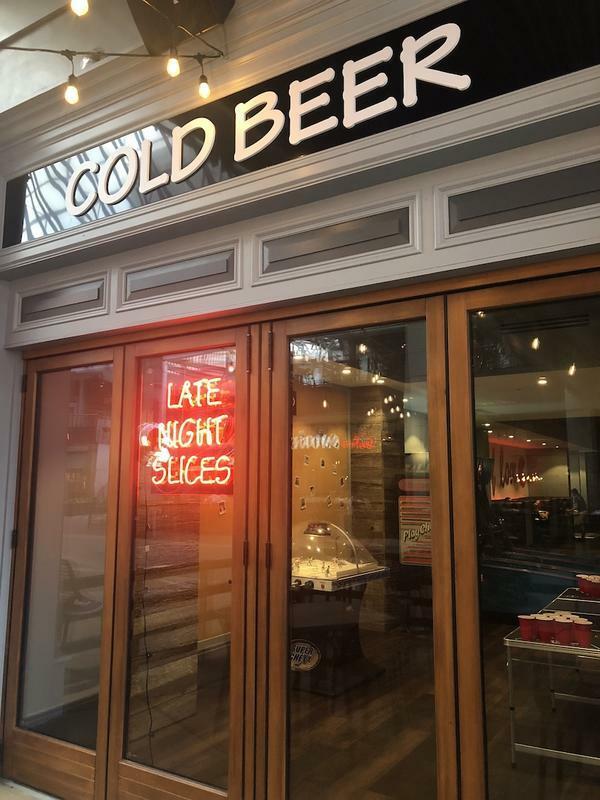 For you night owls, Pizza Bar Louisville serves their cheese and Pepperoni slices until midnight or later! Hours are Sun - Wed 11am-midnight, Thur - Sunday 11am - 3am. If there are people wanting pizza, they’ll stay open! Pizza Bar hosts happy hour Monday-Friday from 4-7pm with some great specials, and the restaurant offers a free slice with the purchase of a beverage from 4:30-5:30pm Monday-Friday as well. Finally, you can get one of their specialty pizzas by the slice every Friday from 11am-4pm, which is a great way to sample some of their bigger pies! It's also important to mention that Pizza Bar Louisville offers much more than just pizza though. They‘ve also got a great selection of wings, salads and grinders on the menu, too! Overall, the Pizza Bar is a fun and unique destination for you and your friends to settle in and enjoy one another's company. The comfortable and friendly space offers an exceptional food and drink selection that's broad enough to keep everyone in the party happy for a good while. The convenient location at Fourth Street Live and the general excitement in this bustling area of downtown Louisville make the Pizza Bar a real winner’s choice!